Framed Shadowboxes, sometimes called shadow boxes, are a wonderful way to show life as it's been lived. Shadowboxes are also an excellent way to preserve memories for generations to come. We custom frame shadow boxes for a variety of purposes. In may cases objects and personal items are framed to represent a reflection of a distinguished career. Most often, this is typified by a distinguished military career. At other times, shadow boxes are used to house sporting memorabilia. We have framed jerseys, knives, hats, balls, and other baseball memorabilia. 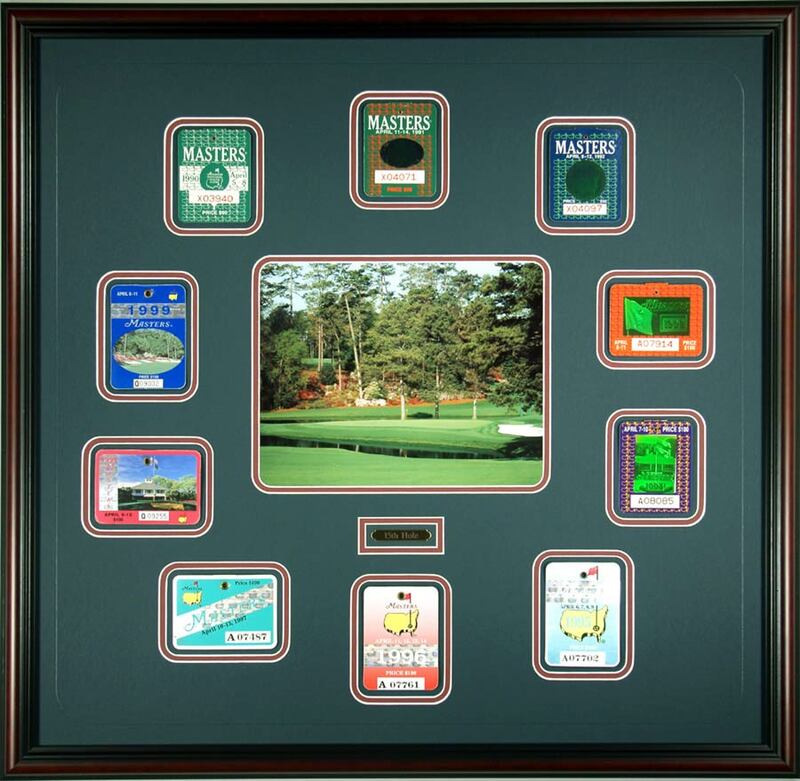 Golf balls, score cards, hole flags and passes make great shadowboxes. Football related items make excellent candidates for shadow boxes! Below, you will find a stadium seat we framed. Antique art, collectable items, and civil war artifacts all benefit from the protection of a shadow box. Below are a few examples of custom framed shadowboxes produced for our clients. This military shadow box was framed using coins and patches. 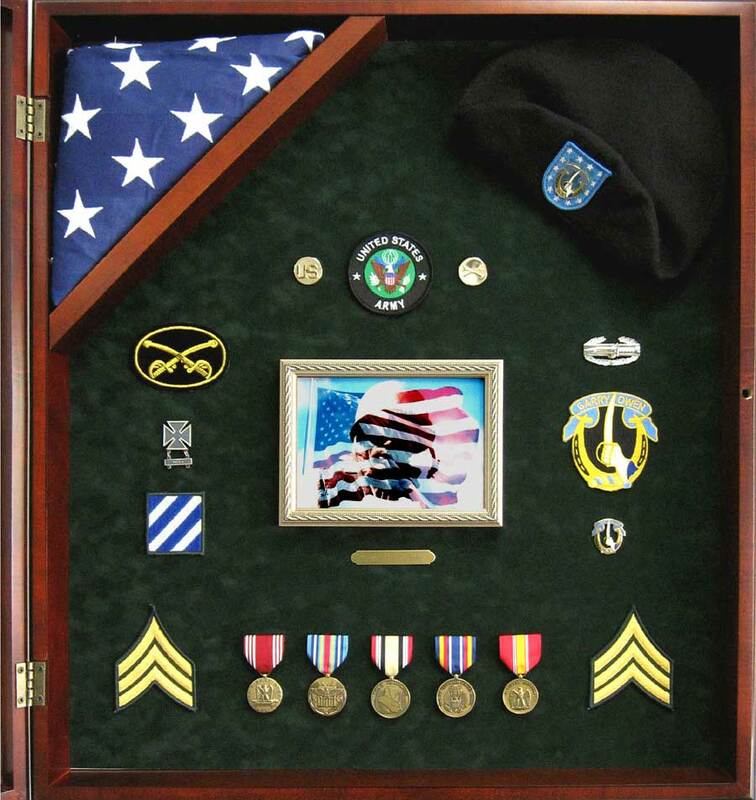 The design typifies a shadow box containing personal items that reflect a distinguished military career. Military shadow boxes make unique gifts for a loved one, or for a colleague. Shadowboxes are often presented at retirement ceremonies as parting gifts. A reflection of a distinguished career deserves the attention to detail and design that we afford our customers. Our specialized framing experience offers an excellent way to preserve cherished items while providing an the opportunity for future generations to “know” someone special and recognize their achievements for more than just the call of duty. 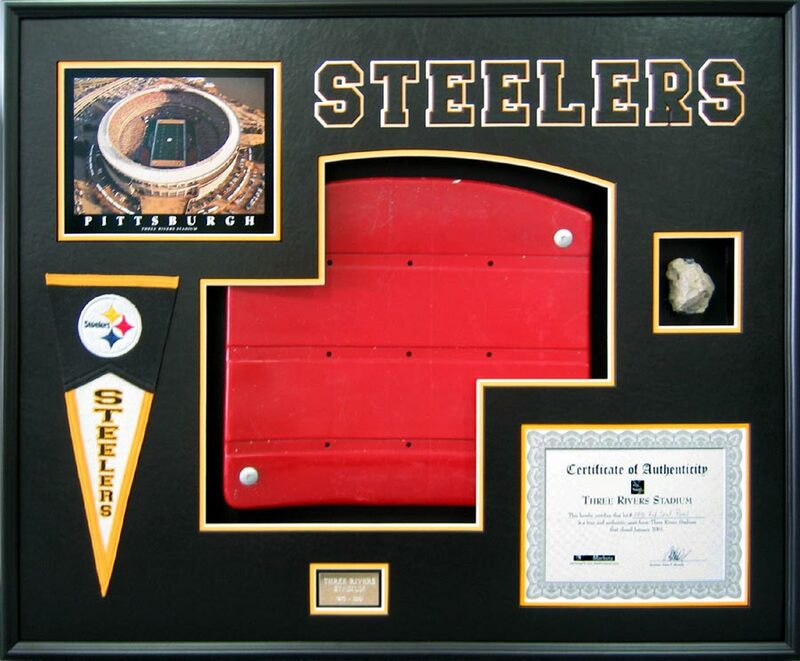 This example of a sports shadowbox includes a stadium seat, the certificate of authenticity, a pennant, concrete from the stadium, and name plate. All items are recessed into mats matching the team’s colors. All mats were custom cut to match the required shapes. The name was also custom cut into the mat. A deep black frame is used to house the items and preserve for future viewing. 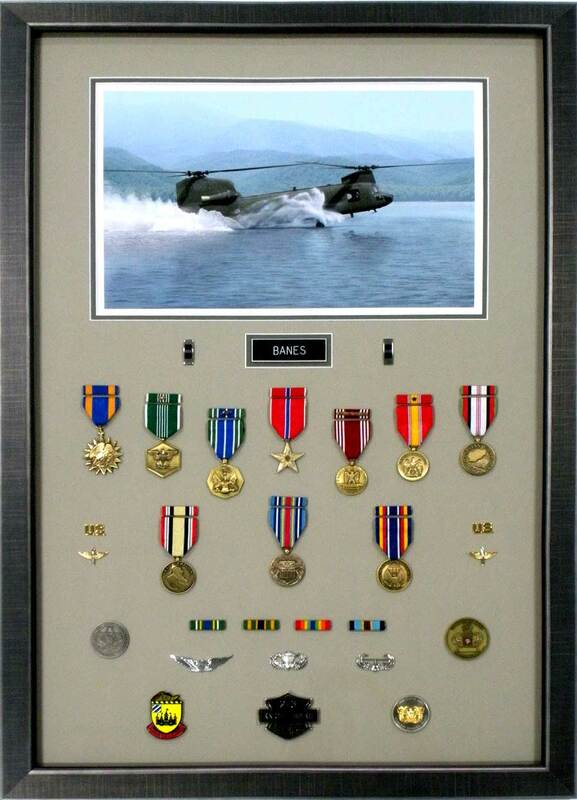 This framed military shadowbox includes a photograph balanced by patches, medals, pins, insignias, and a name tag. The items are surrounded by light green inner and outer mats, and a black wood frame. Military shadow boxes make great retirement and parting gifts. 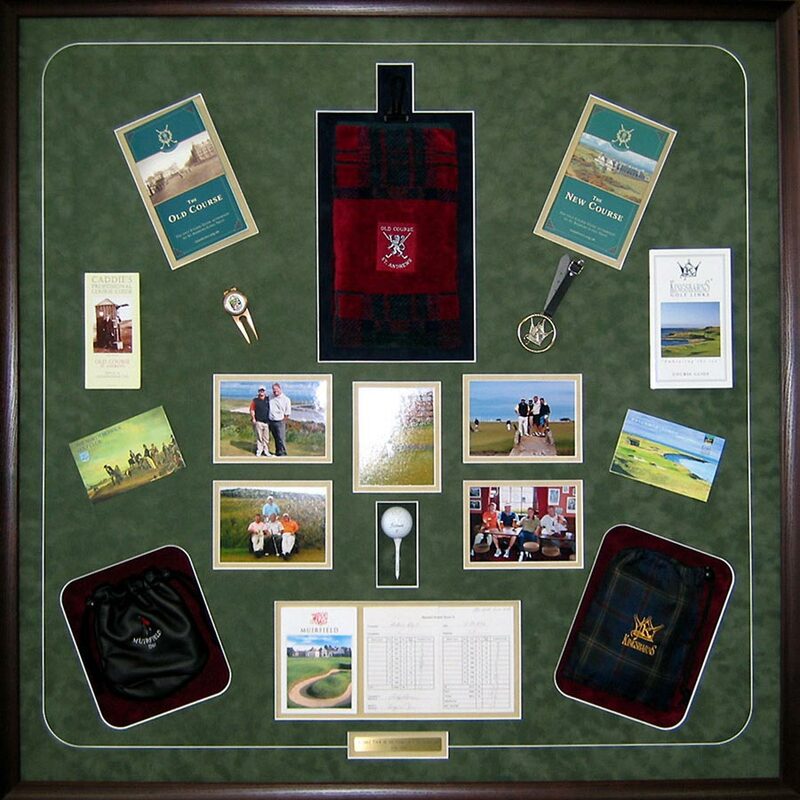 This is a classic golf-related shadow box. It contains a number of items including passes, photographs, a scorecard, and even a ball with the tee. The mats were specially cut to accentuate the design at the corners. A V-groove was cut into the outer mat and, the contents are surrounded by a mahogany wood frame. This example includes a green suede outer mat, cut to hold an American flag. 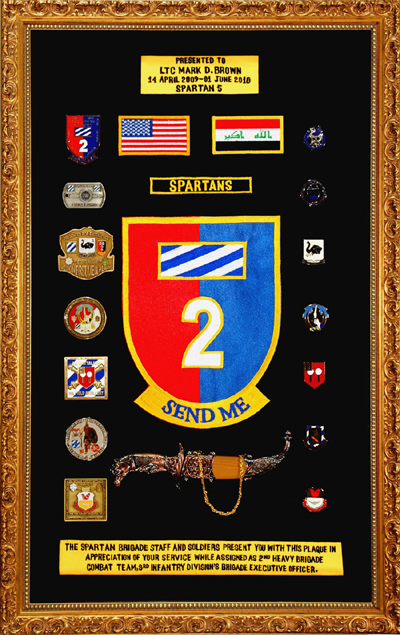 Mounted onto the mat are a number of personal items including name tags, medals, insignias, and a name plate. A deep mahogany frame is used for the shadow box. 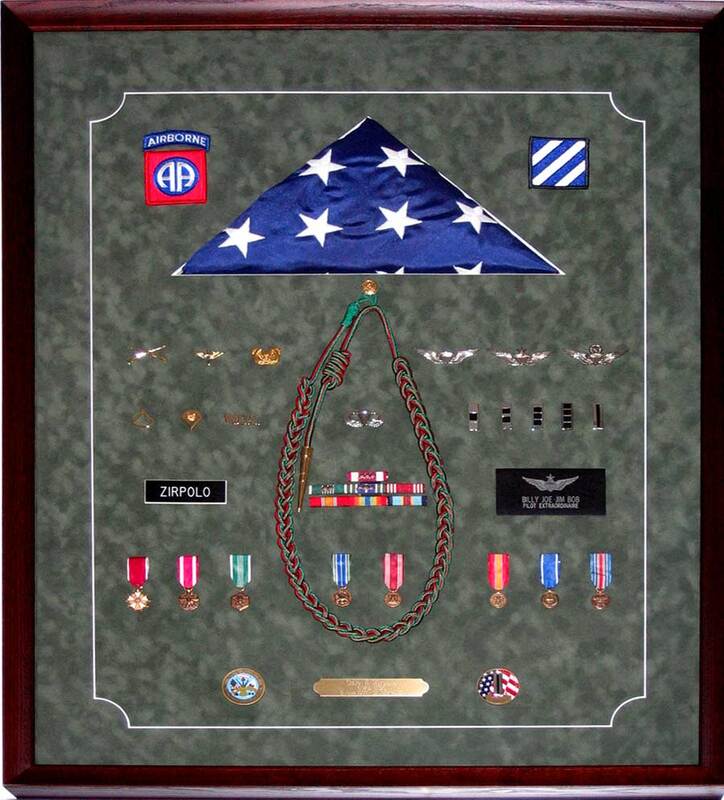 Military shadow boxes offer a great way to display items representative of a distinguished military career. 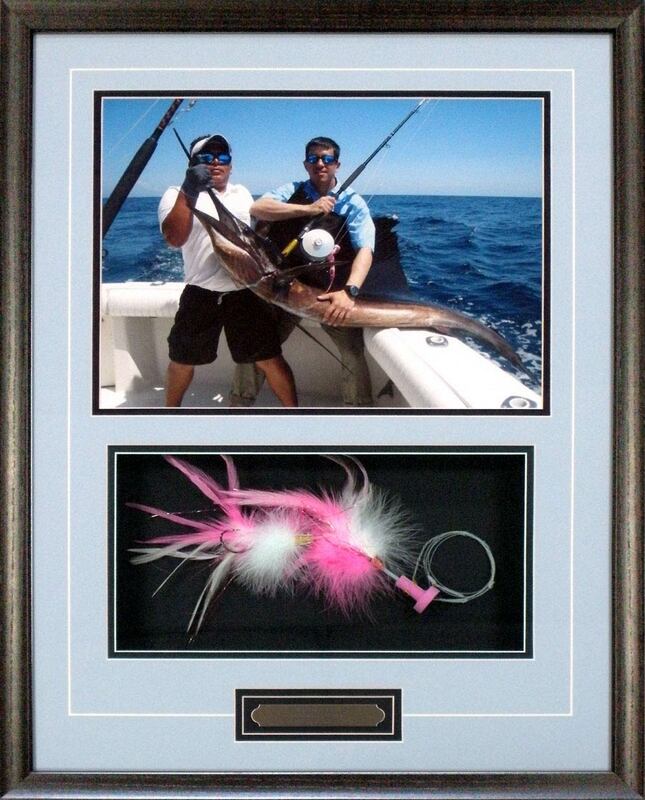 This example includes a photograph of a trophy catch and the lure that caught the fish. The design includes a light blue outer mat, a black inner mat, and is surrounded by a V-Groove. The lure is recessed and secured in place beneath the photograph. A plate beneath the lure commemorates the date. The items were secured inside a black metallic frame. This is an example of a standard flag case. Inside are a flag and a number of personal items. The case is hinged, allowing it to be opened for ease of adding or removing objects. We have framed a number of objects using this case for our clients. Military shadow boxes make great gifts. A collection of original admission passes for the Masters was captured for our client in a shadow box! The design includes passes for several years, a course photograph, and a plate. Multiple cuts in the mats, and a V-Groove, accommodate the memorabilia. The outer and inner mats were also cut with rounded corners to match the shape of the passes, and surrounded by a mahogany and black wood frame. What happen is Vegas stays in Vegas--not all the time. Sometimes the memories are welcomed home. 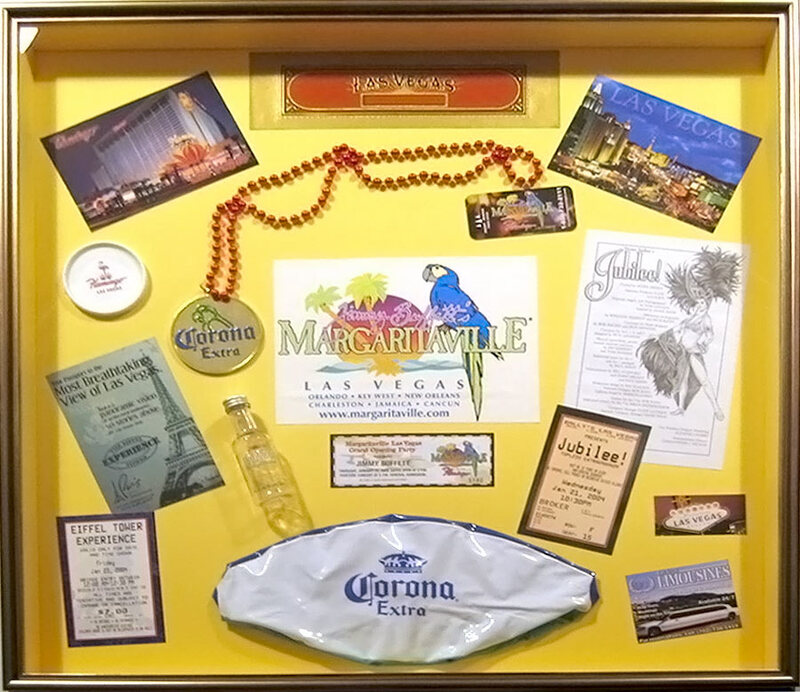 In this case, a memorable experience in Las Vegas made its way to a shadow box. This custom framing job included a number of items displayed and preserved for future viewing. 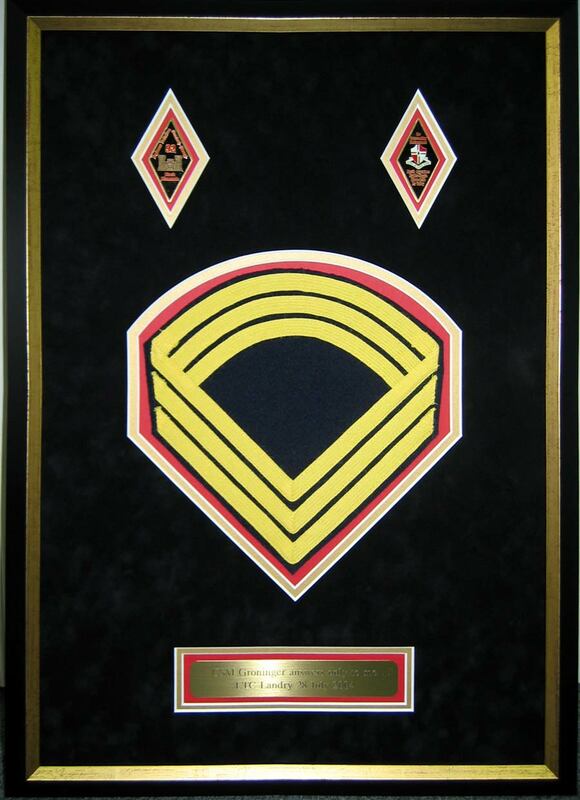 This example includes an embroidered uniform chevron, insignias, and name plate. The items are placed inside a dark blue suede outer mat and red inner mat, all cut to match the shapes of the items placed into the mats and surrounded by a gold and black wood frame. 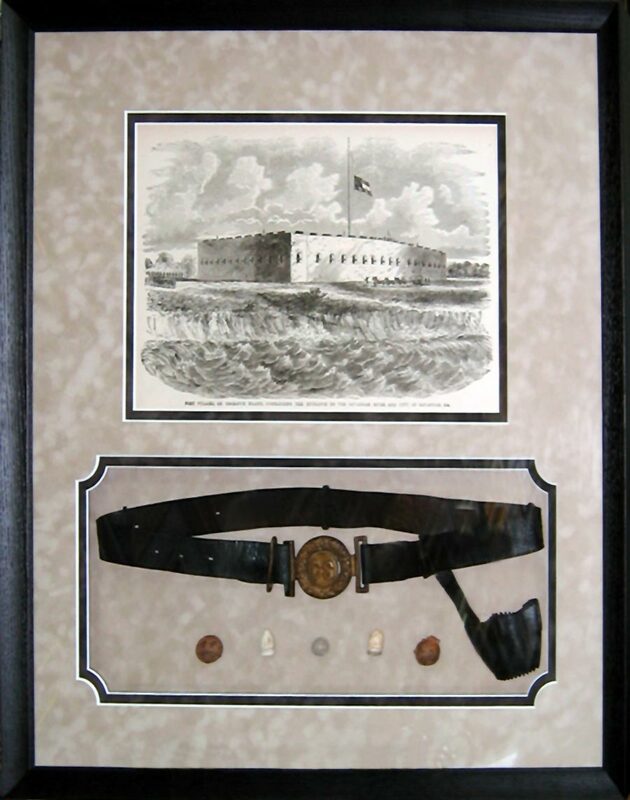 This example includes an authentic Civil War Confederate Belt with a print of Fort Pulaski, and locally dug Civil War bullets. All items are attached to a gray mat to form a shadow box.